I was 13 years old on November 4th 1966 when the Arno crested dumping water, the heating oil naptha, and an estimated half a million tons of mud into homes, businesses, churches and museums in Florence, Italy. Growing up, I understood from the many family stories I listened to that Italians had enough hard times in the 20th century without natural disasters paying a call. Since my parents were preparing to take their first trip to Italy with stops in L’Aquila and Florence, I closely followed the news and studied the photographs of The Great Flood of Florence. In October of 2006, while living in Florence for a month, I was excited to share in the city’s commemoration of the flood which focused on gli angeli nel fango – the mud angels. This name tagged the thousands of volunteers who formed bucket brigades or human chains to extract mud covered books from the National Library and debris from the Uffizi Gallery and other treasure houses. Posters marking the 40th anniversary were taped on every shop window and visible at bus stops and little bill boards throughout the city. Where I “borrowed” mine from will remain a secret, but I look at it every day in my home in Washington where it hangs in my kitchen. Another poster inspires me these days- blogAway’s emblem, created by Sammy Dunham for the blogger conference we are organizing called ‘Let’s Blog Abruzzo’ which takes place 1-2 June 2013 at Sextantio in Santo Stefano di Sessanio. Visit www.blogAway.org to understand how you can join in the human chain to support L’Aquila and also have a wonderful experience at this unique 2 day conference. 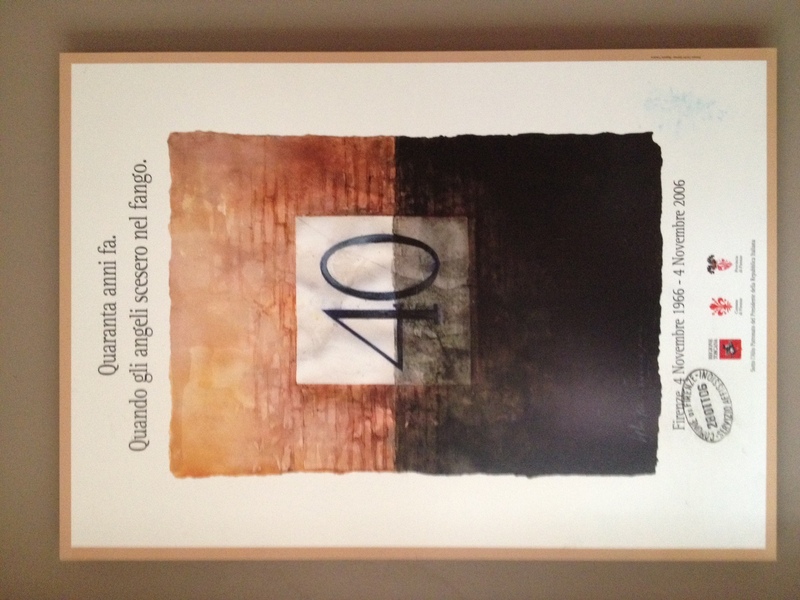 Someday I hope to hang another anniversary poster- one commemorating the days gone by when angels convened in Abruzzo.